Address: 1056 Budapest, Só u. 6. The hotel has 74 rooms. From its excellent location at the very centre of Budapest, in the heart of the pedestrianized shopping area, Boutique Hotel Budapest represents the very best in modern and relaxing urban design. 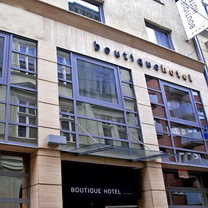 Boutique Hotel is situated right in the city centre, only 50 yards from the River Danube. Step out of the front door and you are on the famous Váci Street, where there are hundreds of boutiques, shops, cafés and restaurants. Many of Budapest"s most famous sights are within easy walking distance. The area around hotel is also well served by public transport.